I know it just doesn't sound right to have a book feature section on a car blog, but some cars books can't really be ignored and should actually be read. And let's not forget that there is also a wealth of information outside of the internet often published in an accurate, entertaining, and grammatically superior format. I don't care to review books so much as just bring them to attention. And it helps that I found this one for $6. Cars of the 70's is chronologically the latest in the George Flammang series that starts with the 30's and hopefully will grow to include the 80's and 90's in the near future. As with the other Flammang books, it's largely centered around the domestic market. 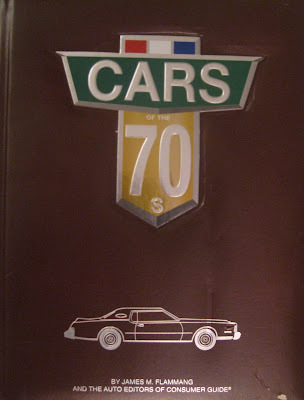 Obviously if this trend continues, the books are going to get lighter and substantially less interesting every edition, but Cars of the 70's still remains packed with nearly 2,000 pictures (didn't count), heaps of useful information, and loads of vintage advertisements. Cars are presented in chronological order and in subsets of major domestic makes with import and miscellaneous vehicle endcaps closing each year. I was attracted by the massive pseudo vinyl cover and gleaming chrome lettering, but this book is entertaining and offers a good bit of research material for your 70's car curiosities.